We currently ship to the 48 Contiguous United States and Alaska. We do not ship to Hawaii, Canada or overseas. All orders are shipped from our Nashville, TN distribution center. On occasion, during late November and December, an additional business day is needed, based on high order volume. Thank you for your understanding. Order before December 20 at 12 PM CST for pre-Christmas delivery (FedEx 2 Day required). Please note our holiday closings, including Good Friday, Memorial Day, Independence Day, Labor Day Thanksgiving, Christmas Eve, Christmas Day, New Years Eve and New Years Day. 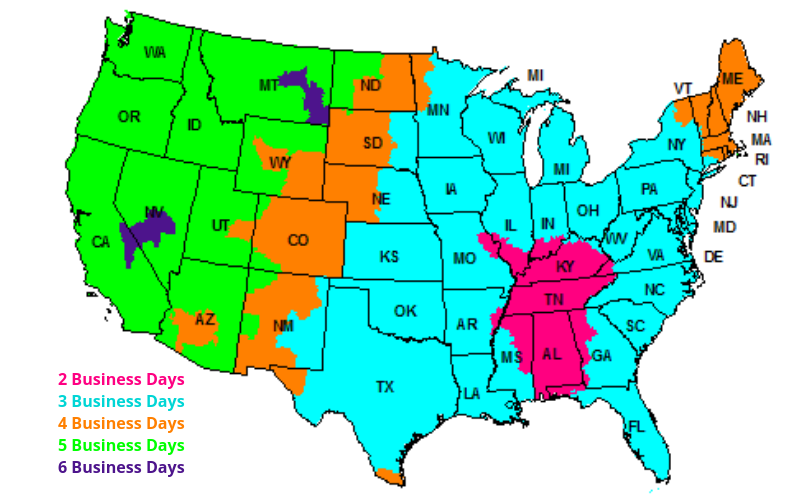 Ground Shipping In The Contiguous U.S. The map below is provided by FedEx. During inclement weather and the holiday season, these transit estimates may vary. Transit times exceeding these estimates are not compensated by MYCHANIC. At the discretion of the carrier, orders may be delivered on a Saturday or Sunday, but this is not guaranteed. Carriers may experience delays in package handling, especially during the winter and holiday season. These delays are unfortunate, but outside of our control. Shipments delayed by the carrier cannot be compensated by MYCHANIC.